Access to quality wood fibre is giving Saskatchewan’s Edgewood Forest Products, which started operations this past January, the opportunity to produce higher quality products. When B.C.-based C & C Wood Products looks for acquisitions, the decorative wood paneling and lumber producer first takes a long, hard look at the wood basket attached to the facility. It liked the profile of the timber allocated to the mothballed Weyerhaeuser stud mill in Carrot River, Saskatchewan, so it purchased the mill and renamed it Edgewood Forest Products. “We do have very high quality fibre,” says Andy Borsa, longtime mill manager, adding that there is the potential to produce higher quality products from the wood basket. C & C Wood Products was excited by that prospect. Trees in northern Saskatchewan grow slowly. Therefore, the Carrot River stud mill produces very tight grain, small knot, high density and high strength lumber. This results in an attractive appearance product, which can mean a lot to big box store clients. The average log diameter feeding the stud mill is about six inches. “We spent a good deal of time considering the wood supply that the mill traditionally had and working with the provincial government to ensure access to it was maintained,” says Ron Dunn, C & C Wood Products Group vice-president and chief operating officer. 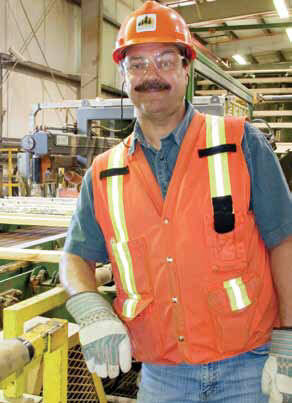 Longtime Edgewood Forest Products employee and mill manager, Andy Borsa. This purchase marks another step outside of B.C. 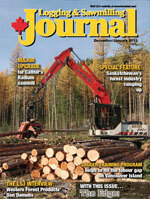 for Quesnel-based C & C Wood Products. About seven years ago, it purchased another mothballed Weyerhaeuser sawmill in Grande Cache, Alberta, largely because of the exceptional, tight grain, high strength, small knot, lodgepole pine wood basket attached to that sawmill, and renamed it Foothills Forest Products. The Carrot River stud mill, which started up in January after five years of being in mothballs, not only opened a new frontier for C & C Wood Products, but it also represents an important milestone for Saskatchewan’s forest industry. In 2006, the province witnessed a near collapse of its forest industry precipitated by the closure of Weyerhaeuser’s pulp mill in Prince Albert as well as a drop in softwood lumber and panel board demand because of the United States housing crisis. A number of forestry operations from sawmills to plywood plants to oriented strandboard plants shut down in reaction to both events. 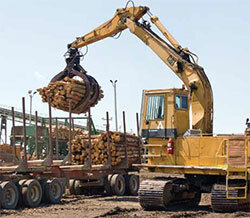 However, the recent re-commissioning of the Carrot River stud mill as Edgewood Forest Products and the Prince Albert pulp mill as Paper Excellence—as well as the reallocation of Weyerhaeuser’s large forest management area (FMA) to a number of other forest companies—signals the start of a new era for Saskatchewan’s forest industry. But it is unlikely that even C & C Wood Products expected the positive things that happened when the line started producing lumber in Carrot River. Within only four days, the stud mill had achieved full production with 12 fewer employees. Borsa says staff were able to ramp up production so quickly because of how well maintained the mill was prior to the five years that it was shut down. The stud mill was also able to attract many of the experienced tradespeople who had worked there previously, back to their jobs. Borsa himself has been working on the Carrot River site for 36 years, in a management capacity since 1980 and as the plant manager since 1993. He says one reason why the stud mill is now able to operate with fewer employees is because working for a smaller company requires less administration and the stud mill has looked at ways to operate more efficiently. At present, it provides 50 jobs. As part of its purchase agreement, C & C Wood Products also purchased Weyerhaeuser’s plywood plant in Hudson Bay, Saskatchewan, which has yet to reopen. Edgewood Forest Products is eager for that to happen as the opening of the plywood plant will provide the stud mill with a better home for its oversized logs, which are 13” and over. The reopening of the stud mill in Carrot River, Saskatchewan opens a new chapter in the province’s forest industry under the leadership of new owners, C & C Wood Products, based in Quesnel, B.C., and has been a boost for the community. The reopened operation attracted many of the mill’s experienced employees back to their jobs. Carrot River, about two-and-a-half hours northeast of Saskatoon, has a long association with the forest industry. In 1975, a government Crown corporation called the Saskatchewan Forest Products Corporation built a modern dimension lumber sawmill on the current stud mill site, as well as a plywood mill in Hudson Bay, providing logging jobs for local residents. “This is a good area for a sawmill because we are right on the edge of the whole northern forested area, which puts us reasonably close to the raw material, but we’re not isolated,” says Borsa. “We have good infrastructure such as rail service, natural gas, decent power rates and a good highway system.” However, he acknowledges that distance to market has always been a challenge for the stud mill. With Weyerhaeuser, product was typically shipped to the American Midwest. Now, sales are more focused on the domestic market. The government-owned dimension sawmill was converted to a stud mill in 1993 because private companies active in the area that were using smaller diameter timber had shut down. The government reacted by deciding to send smaller diameter timber to Carrot River to produce studs and larger logs to Hudson Bay to produce plywood. A short time later, the Crown corporation entered into a partnership with MacMillan-Bloedel (MB), which had constructed a waferboard plant in Hudson Bay. This resulted in a new business entity called Saskfor-MacMillan Ltd. in an effort to more efficiently harvest the wood in the FMA supplying the waferboard plant, the stud mill and the plywood mill. The partnership was more efficient in managing the forest because it required fewer logging contractors as they could now harvest both the hardwood and softwood in one pass. A series of quick ownership changes then occurred, with MB purchasing the government’s interest in the partnership. Eleven months later in 1999, Weyerhaeuser became the stud mill’s owner with its purchase of MB and that ownership scenario continued until the end of 2006 when Weyerhaeuser closed the stud mill. It also closed the pulp mill in Prince Albert, as well as the OSB plant and plywood plant in Hudson Bay. C & C Wood Products helped to breathe life back into the industry when it purchased the stud mill and the plywood plant in 2010. Borsa says many Carrot River and area residents were happy and relieved to hear that C & C Wood Products had purchased the mill because of its importance to the community, not only for the jobs it provides directly but also logging jobs throughout northeastern Saskatchewan from Prince Albert to Hudson Bay. “The five year closure was tough,” says Borsa, “although there wasn’t a mass exodus from Carrot River because I think people were optimistic that it would start again. When you talk to local business people, they are very happy and everyone is behind the mill 100 per cent. Being a small town, it’s very important economically.” He adds that the closure was especially hard on local logging contractors. A few managed to stay in business by picking up contracts wherever they could. 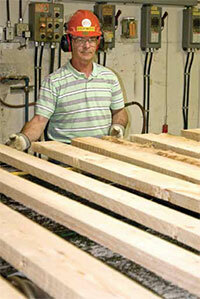 Today, the stud mill produces three to six inch width lumber in lengths from six to nine feet. They also produce some one inch thick appearance grade material in various lengths. The stud mill will produce 40 million board feet annually on one shift but is designed for two-shifts capable of double that production. Borsa says ramping up to two shifts will depend on the lumber market. At 40 million board feet, the stud mill is consuming about 150,000 cubic metres of softwood, consisting of about 70 per cent white and black spruce with the remainder jack pine. Eight and nine foot cut-to-length logs enter the stud mill on two infeed decks and are processed either through the 12” Nicholson A5 debarker or the 17” Nicholson A5 debarker, leading into seven sort bins. 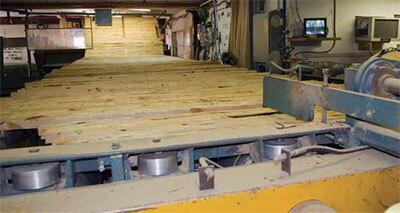 The Edgewood Forest Products stud mill processes high quality, eight and nine foot cut-to-length logs. The tight grain, high strength logs produce a premium product. The logs are then ribbon fed through an Optimil chip ’n saw. The stud mill is able to ribbon feed from each bin and achieve good recovery because the logs are sorted by diameter. After the chip ’n saw, the lumber encounters a Newnes four-sided scanner. 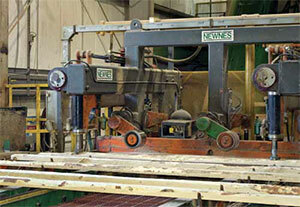 Any material requiring remanufacturing is diverted through a Newnes board edger. All on-grade material drops down and bypasses the edger. All the lumber ends up in a Newnes 10-bin sorter and then to the stacker. The lumber is kiln dried and sent to the planer mill where it is finished on a Coastal high speed stud planer and manually graded. Based on the grade mark, the finished lumber is trimmed on a Newnes multi-saw trimmer and sorted and stacked using a Newnes 16-bin sorter and stacker. The lumber is strapped using a Signode strapper, wrapped, and placed in queue for delivery either by truck or by rail. The focus now is to generate income for the stud mill’s new owner, but Borsa says an eventual move into more value-added production would give the stud mill a better future. “It obviously would give us a new market and another opportunity when commodity lumber prices go in the tank, so I think it’s important, a good strategy and the right direction. But to get there is going to take a bit of time,” he concludes.